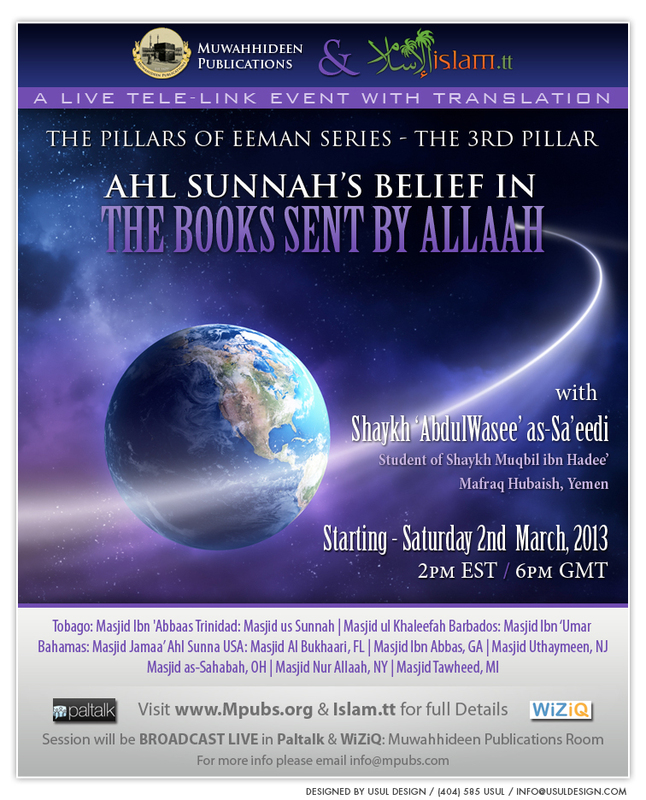 On Saturday 2nd March 2013, our Shaykh ‘Abdul Wasee’ as-Sa’eedi (May Allaah Preserve Him) continued with MPUBS' online lecture series entitled “The Pillars of Eemaan”, with the 3rd Pillar, The Belief in The Books. Shaykh ‘Abdul Wasee’ is a student of Ash-Shaykh Al-Allaamah Al-Muhaddith, The Imaam of Yemen, Abu ‘Abdur Rahmaan Muqbil Ibn Hadee al-Waadi’ee (rahimahullah); he is based in Mafraq Hubaish,Yemen and is also a student of our Shaykh 'Abdul'Azeez ibn Yahya al-Bura'ee (hafidhahullaah). This event will be broadcast LIVE in Masjid Ibn 'Abbaas, Tobago, two masaajid in Trinidad, Masjid ul Khaleefah and Masjid us Sunnah, and six Masaajid in the U.S. Masjid Al-Bukhaari, Florida, Masjid Ibn 'Abbas, Georgia, Masjid Uthaymeen, New Jersey, Masjid Nur Allaah, New York, Masjid as-Sahabah, Ohio and Masjid Tawheed, Michigan. Muwahhideen Publications and Islam.TT in conjunction with Masjid Us Sunnah, Trinidad, is pleased to present our brothers and sisters in Islaam with a weekly online class which will be taught by our noble brother ‘Abdulillaah Lahmami (hafidhahullaah). 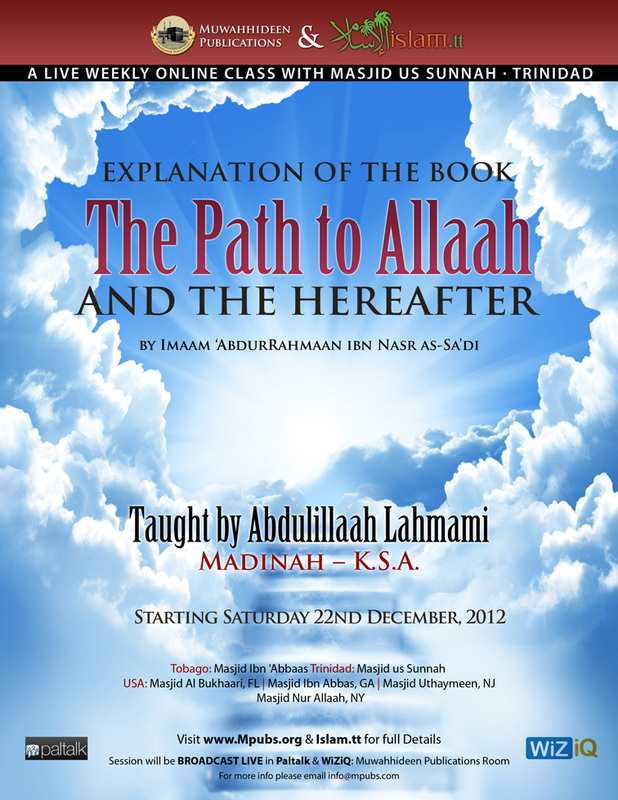 The class commences this Saturday 22nd December, 2012 and will continue every Saturday by the Permission of Allaah. This session will be broadcast LIVE in Masjid us Sunnah, Trinidad, Masjid Ibn 'Abbaas, Tobago and in the US in Masjid Al-Bukhaari, Florida, Masjid Ibn 'Abbas, Georgia, Masjid Uthaymeen, New Jersey, and Masjid NurAllaah, New York. The Noble Shaykh, Aba al-Hassan 'Ali ibn Mukhtar ar-Ramly (May Allaah Preserve Him) from amongst the scholars of Jordan, and a very strong student of Shaykh Muqbil ibn Hadi al-Wad'ee (rahimahullaah) started a weekly web class with Muwahhideen Publications on the explanation of the book "The Purification of The Aqeedah" by Imaam Muhammad ibn Ismaeel al-Sana'nee (rahimahullaah). These weekly classes are translated LIVE into English.